In November 2002, I flew from Moscow to the US for the first time in 15 months. When I left my Boston hotel at about 6:30 am to go to work, I was shocked by what I saw. Business people criss-crossing streets at a fast pace, nearly everyone holding either a Starbucks or Dunkin Donuts coffee cup. I don’t think I saw anyone in Moscow at that time drinking coffee on the streets. Yes, you could buy ‘3 in 1’ instant coffee at Moscow kiosks. But the kiosk worker would hand you a thin, transparent plastic cup with boiling hot water that would burn your fingers. And as it didn’t have a top, you really couldn’t walk with it. Only years later could you get coffee to go in a paper cup…but workers would often give it to you without a top because they weren’t used to it. Now you can get ‘coffee to go’ at nearly every Russian cafe and you can see people walking around the streets of Moscow with coffee. Now that coffee-to-go culture has become acceptable in Moscow, it is natural to expect that people would open street stands that sell coffee. That is what Yana and her two friends from the town of Ivanovo recently decided to do. 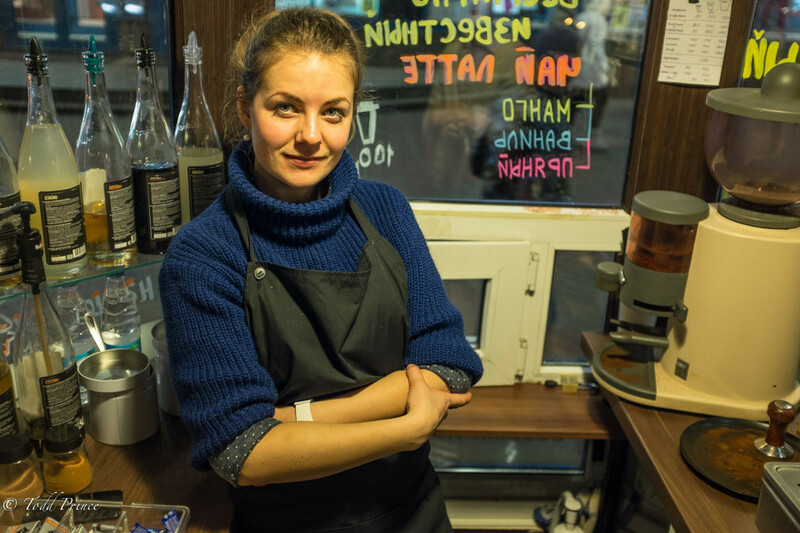 Yana, 29, and friends called their coffee business Black Rabbit. The word ‘black’ represents dark-brewed coffee while rabbit in their view implies ”something positive.” Yana and Alexei, a co-owner, are focused now on developing Black Rabbit into a recognizable brand in Moscow. Yana and Alexei have read Starbuck CEO Schultz’s autobiography. ”I wanted to hear about the experience of the man that built a coffee empire,” Yana said, explaining why she read the book.